Whatever they say about starting at the top, the key to visiting the Grand Canyon is to start at the bottom. The river life, the clutter of greenery hanging on to the brown river snaking through the valley floor that is the Colorado river in its current dehydrated state. The river folk and the Hualapai Indians say that they have never seen it so low. Hoover Dam is down to the levels it hasn’t seen since another dam was built upstream in the late 1960s. And the blue Colorado water has turned a delightful shade of, well, brown. Strips of colour illuminate the rocks in the high valleys beyond. Every now and then there is the shadow of a helicopter swooping along the ancient (or rather middle-aged, the canyon is just 6m years old) rockery, for this is one of the great tourist icons of the American west. But here at the water level it is more spectacular than anything you ever imagined. If you speak to someone who has been to the Grand Canyon, the chances are they will have travelled the 278 mile road trip out from Vegas with one of the city tour operators and visited the South Rim. There are about fifteen viewing points here, some accessible by tour bus, some by car, and some used as bases for helicopter flights over the canyon. Canyon View Information Plaza at Mather Point is a tourist thoroughfare, with parking and traffic problems and visitors ferried in by shuttle bus. The folklore of the Grand Canyon claims that it is a mile high. In fact it is higher at its highest point, Point Imperial, a place where you can scarcely see the river at all, and a good deal lower at much of the elevations along its 277 miles course. South rim is easier to get to. The brochures in your hotel room in Vegas will be full of options, costing between a hundred and $500 to get to. The north rim takes a great deal of perseverance, a roundabout trip through Utah to see the highest point and a very different canyon indeed, higher than the south and the higher than the west. For the best experience go west. The approach to the western rim is more classic desert landscape, more spiritual, more likely to transport your mind as well as your body but also filled with fake western ranches staffed by broadhatted cowboys ushering you to the helicopter port. Further along the unpaved road past the Joshua trees and cowboy matinee mountains, the access points to the canyon are managed by the Hualapai Tribe, and their village is to be enhanced by a skywalk viewing platform. While 5m Canyon visitors per annum go to the south rim, just 300,000 go to the west rim. Compared with the 15 viewing points on the South Rim, here there are two viewing points and a third which is accessible by appointment only. The favourite is Eagle Point, and here in January a skywalkbridge structure will open. The idea is to allow visitors walk out on a glass surface 4,000 feet over the canyon and look down to catch their breaths. Here you are twice as high as the Empire State (1,250 feet) or Taipei 101, the highest buildings in the world (1,671 feet). Nature wins that one 4,000 feet down. Ask the Hualapai. They understand. The north rim is open from May 15 to October 15 and is inaccessible when it is at its beautiful best, covered by five inches of snow. The road from Jacob Lake to the North Rim, Highway 67 is closed from the first heavy snow in November or early December to mid-May. The only way of reaching the rim is by skiing cross country. For those making the journey the rewards are great. The three developed viewpoints on the North Rim offer a sense of looking across the expanse of the canyon, rather than into its depths. Views of the Colorado River are rare and distant. Point Imperial, the highest point on the North Rim at 8,803 feet, overlooks the Painted Desert and the eastern end of Grand Canyon. Layers of red and black Precambrian rocks, not visible at Bright Angel Point, add contrast and colour. The landscape changes as you venture further to Cape Royal, North Kaibab Trail, Bright Angel Point and eventually, after a rough, two-hour (one-way) trip by four-wheel drive, to reach Point Sublime, the western-most of the North Rim viewpoints. It is approximately 8,500 feet in elevation over the river, and you are now a 215-mile drive from the South Rim. It doesn’t look like that on the map. Bigger and longer than we imagined, the Grand Canyon is one of the great tourist attractions that lives up to its own hype. But remember to seek out the best angle. When you find it, it could be surprisingly empty of your fellow tourists. Grand Canyon West tour, panoramic experiences at the Grand Canyon’s western rim with a helicopter trip to the valley floor and the Skywalk Glass Bridge due to open in January. n Day-use visitors should expect traffic congestion and parking problems, particularly in summer. The least crowded time is November through February. n A hiking trail, known as the Rim Trail, follows the south rim from Pipe Creek Vista to Hermits Rest. The section of the Rim Trail between Pipe Creek Vista and Maricopa Point is paved. 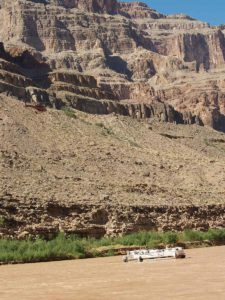 Grand Canyon West (located on the south side of the Colorado River) is managed by the Hualapai Tribe. The Hualapai Indian Reservation is located on the south side of the Colorado River. Kaibab Plateau Visitor Center on the North Rim is operated by the U.S.D.A. Forest Service opens on May 15th. Distances are deceiving in this part of the country. It may look like you can visit three parks in one day, but reality is often different. Carry water, particularly during summer months. www.destinationgrandcanyon.com for more information on the canyon and the Skywalk. Tour America currently has packages to Las Vegas at u479 return. They offer Las Vegas as a pre or post destination for their upcoming Hawaii Programme or 4-7 days combined with Orlando, Los Angeles, San Francisco, or New York. www.touramerica.ie 01 817 3500 or your travel agent. Delta Air Lines fly daily from Dublin and Shannon to Las Vegas via Atlanta with four daily flights in summer 2007 and several daily connection flights fto Las Vegas. Business class upgrades are available with Tour America. 1850 5088231 www.delta.com or your local travel agent.